The sun shone, the ukes played and fantastic time was had by all! At the Lothersdale Hotel on Morecambe's sea front, ukulele players from all over the country came to enjoy a traditional seaside themed weekend of music and activities. On the Friday night, after settling and admiring the panoramic view of the Lake District from the hotel, guests settled down to a buffet and a concert featuring Michael Adcock, Dead Mans Uke and Feckless & Fuddle, before several of the braver ones took to the stage themselves for an open mic performance. On Saturday, Professor Eek gave a highly entertaining workshop, before all involved headed to the Eric Morecambe statue for an outdoor performance of 'Bring Me Sunshine'! After lunch, Eek was back with a sidesplitting Punch and Judy show (rude but VERY funny). The evening entertainment began with more Feckless & Fuddle, followed by Eek & Elsie and The Mersey Belles. A break for fish, chips and mushy peas (and popcorn and candyfloss machines), and it was on to the utterly brilliant Ukulele Uff and the Lonesome Dave Trio, who had everyone on their feet. The cries of 'MORE' at the end of their set would have been heard in their native Liverpool! Capping off the evening and filling the dance floor were the superb Anything Goes Orchestra. As event organisers, our only concerns were for one gentleman who nearly laughed himself to death at the Punch and Judy, and for what might have happened should Ukulele Uff not had a few more songs up their sleeves for the demanded encores! A brilliant weekend, with brilliant guests and loads of top class ukulele music. The end of February is one of those times when nobody is up to much. So what better time then to book a huge 90 room hotel in the middle of the Cumbrian countryside, and pack it full of ukulele players for an amazing fun filled weekend! Top acts performed in the ballroom, there were workshops, big singalongs and the staff at the Gilsland Spa Hotel provided fantastic food for the whole weekend. The Friday night kicked off with a gig, opened by the wonderful Zoe Bestel. Guests were then entertained by Dead Mans Uke before listening to Mike Hind's set. Mike is a greatly talented artist from Bermuda and started his UK tour at our event. And he was fantastic. After a buffet, we then strummed and played long into the night with a lively open mic session. On Saturday, after a suitably large breakfast, the workshops began - either side of a big hot buffet lunch.... (food was critical to this ukulele event!). In the afternoon, local uke group Ukes Akimbo led all 160 guests in a Big Strum & Singalong, probably the noisiest part of the weekend! There was barely time to get quickly changed and into the restaurant for an excellent gala dinner, then back into the ballroom for sets from Ben Rouse, Phil Doleman and The Mersey Belles. What a fantastic time we all had. We were inundated with messages of thanks from guests. The hotel staff thought it was great and praised the ukulele playing guests for being so warm, friendly and eager to have fun. It was wonderful. Can't wait til the next one! 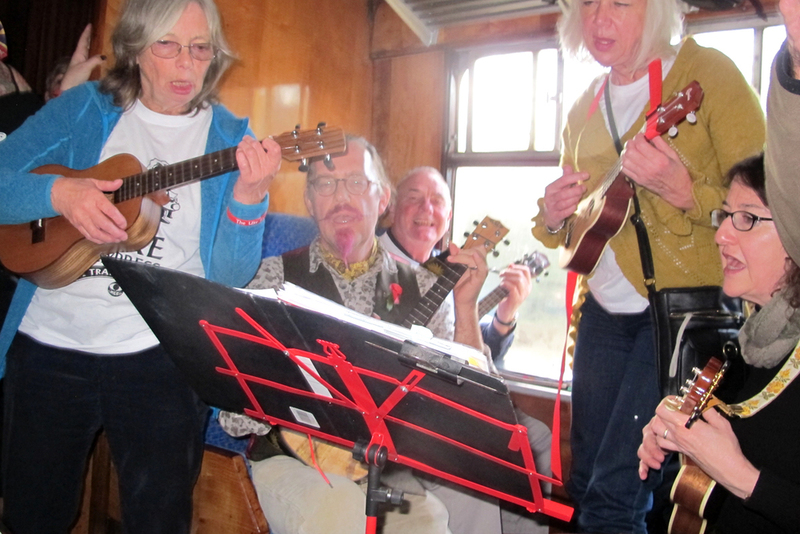 What a time was had aboard the first Uke Express, with three hundred ukulele players climbing aboard a specially chartered steam train. With songbooks provided to everyone aboard, before the train even pulled away from the station the carriages were filled with signing and strumming - something that never abated for the whole trip! 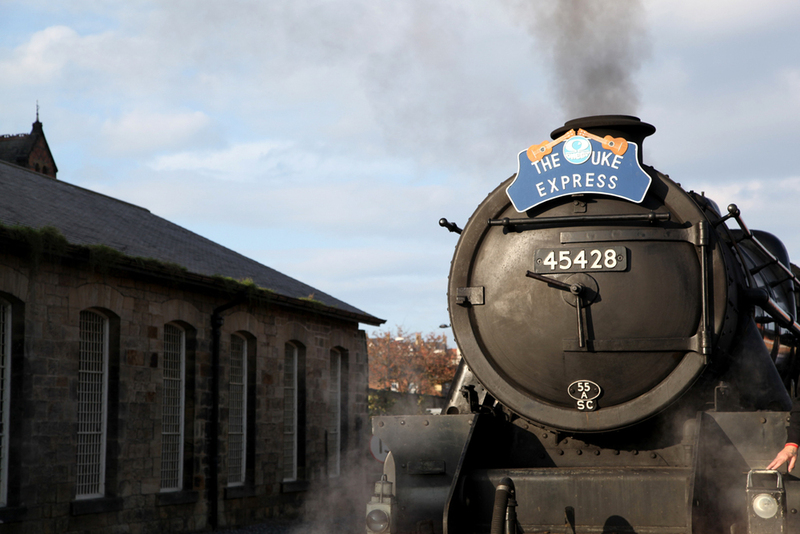 The Uke Express took place on a bright and sunny winter's day in Pickering, North Yorkshire, using a classic engine on the NYMR line across the moors to Whitby. There we ate fish and chips, busked, played in pubs, walked to the Abbey - all sorts of things! On the way back, our thoughts had been that after a big lunch, passengers would settle down for a quieter journey. But not a bit of it! If anything the enthusiasm for singing and playing only increased! It was a pleasure to travel up and down the ten carriages of the train, seeing so many smiling faces. And when the train pulled back in to Pickering, there was a fantastic ukulele concert waiting, with Ooty & The Cloud, Zahra Lowzley, Phil Doleman and the Anything Goes Orchestra playing a fantastic gig as a great finish to the event.